Powers/Abilities: Cat-Man has no superpowers but is a good fighter and is invention-heavy, including a Luger, utility belts, and night-sight visors which also shine beams of light if needed. History: In the wilds of Australia the Cat-Man hunts, striking at crime from a mountain headquarters. He is not limited to Australia, however, ranging around the world and fighting against all evil-doers. He is assisted by Kit and by his fiance Terry West, who works for the "United Nations Press," and by Terry's father, the noted scientist Professor West. 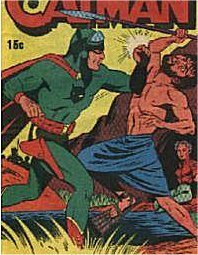 Comments: Originally based on the American Cat-Man, when wartime rules stopped imports, Australian stories made him a whole new character. Image used to the left on this page courtesy of Darrin Wiltshire's Micro Heroes site, used with permission.